After the revolutions in the Middle East earlier in the year proved the effectiveness of social media technology as a rallying mechanism, the U.S. State Department is looking to promote further efforts by financing the creation of wireless networks that would allow activists to interact outside of government surveillance. The project is aimed at countries including, but not limited to, Iran, Syria, and Libya, following previous efforts in Afghanistan in which the U.S. government spent about $50 million to create a cell phone network independent of Taliban control. 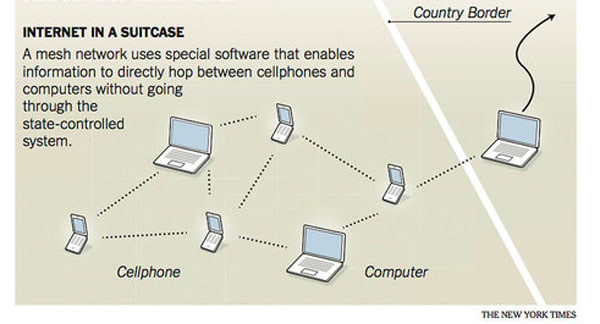 Of the technology being developed, an “internet-in-a-suitcase device” is now a reality, using “mesh network” technology in which cell phones or PCs can be transformed to create an undetected wireless web without a centralized hub. In China, efforts are less sophisticated but nonetheless ingenious, with American operatives burying Chinese cell phones in hills. The policy is certainly advantageous to everyone involved—committing technology is a lot less costly than committing bodies.